More “pit bulls,” and dogs misidentified as such, die in U.S. shelters each year than any other dog. They make up the majority of dogs entering the shelter system due to breed discrimination, misperception, and popularity with backyard breeders. And, they also represent the largest number of animal cruelty and neglect victims arriving in shelters each year. That’s why HSHC dedicates the month of March to Pit Bull Education. First, it’s important to understand that “Pit Bull” is nothing more than a catchall term referring to “bully breed” type dogs. From large-and-in-charge Boxers, American Bulldogs, and Mastiffs, to short and stout Boston Terriers, French Bulldogs, English Bulldogs and Staffordshire Terriers, there are a variety of dogs that fall under the category of “bully breed”–including the American Pit Bull Terrier. These dogs are distant relatives sharing similar physical characteristics, tenacity, and an unwavering loyalty to their people. The 2018 Annual Matching Campaign is here…and only 24 days remain to make your dollars count twice. Once a year, your donations are matched dollar for dollar doubling the chances for the animals in our care. That time is now! Thanks to a generous group of donors and HSHC Board Members, donations made to our Annual Matching Campaign during the month of November will be matched dollar for dollar up to $35,000. especially when the number of senior pets abandoned by their owner, cost of care, as well as those arriving in need of emergency and life-saving care is greater than ever before. Your tax deductible donation of any amount makes a difference–and in November–the impact is doubled. On behalf of our team and the animals we’re blessed to serve, we sincerely thank you for your continued support. Please join us for our 10th Annual Woofstock Festival and Survivor Charity Walk THIS SATURDAY October 6th, at the newly renovated Nickel Plate District Amphitheater in Fishers. The day kicks off at 11:30 a.m. with our Survivor Charity Walk, the single largest annual fundraiser for our Survivor Program. Woofstock, Indiana’s largest pet & music festival, opens at 12 p.m featuring dozens of vendors, food trucks, activities for kids including shows throughout the day by HedgeHog Hannah, a Fishers Police K9 demonstration, beer & wine garden, canine activities, and live music from The Doo! and Shiny Penny. Please join us for our 10th Annual Woofstock Festival and Survivor Charity Walk on Saturday, October 6th, at the newly renovated Nickel Plate District Amphitheater in Fishers. The day kicks off at 11:30 a.m. with our Survivor Charity Walk, the single largest annual fundraiser for our Survivor Program, which funds all life-saving and emergency medical care for thousands of animals each year. HedgeHog Hannah, a Fishers Police K9 demonstration, beer & wine garden, canine activities, and live music from The Doo! and Shiny Penny. Now it’s time to Clear the Boutique! Humane Society for Hamilton County? 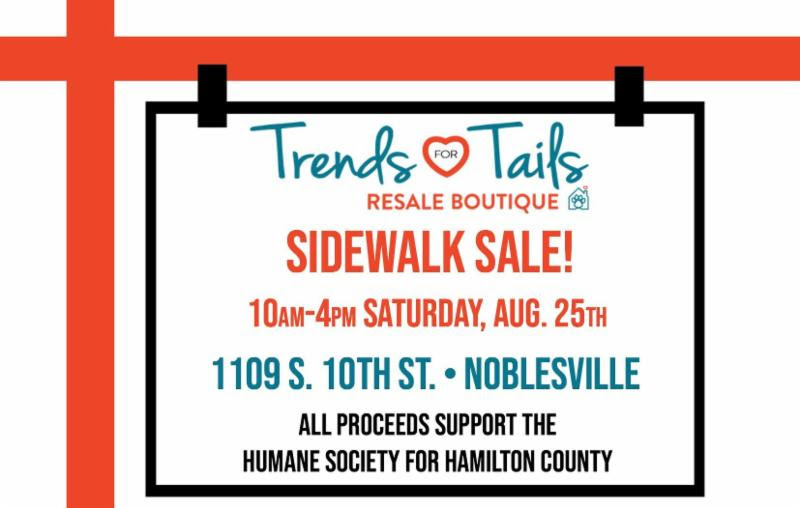 Tito’s Handmade Vodka and their Vodka for Dog People Program which supports no-kill shelters across the U.S. We’re so proud they’ve chosen the Humane Society for Hamilton County to support. Who: Anyone who wants to competitively run, or leisurely walk…along with your dog! 6th Annual Ruff Ride and NEW VIP Nite! VIP Nite: Friday, June 22 – 6:00 p.m. – 9:00 p.m.
Ruff Ride: Friday, June 23 – 11:00 a.m. – 6:00 p.m.
May & June may bring showers and flowers, but it also brings an increase in animals–especially kittens. We depend on our Foster Home Network to not only alleviate our challenges with limited space, but foster homes are the only peaceful place for our injured or ill animals to heal. We also rely on our fosters to give dogs and cats a break from the shelter when depression sets in. Some animals fair better than others in the shelter environment. The daily bombardment of stressors–noise, strangers and the lack of space, light and exercise areas–begins to break them down no matter how much we love and care for them. When that happens–finding a foster who will open their heart and home may mean the difference between life and death. In fact, we would not have achieved our no-kill goal without foster homes. Foster homes save lives. Countless animals would not have received the opportunity to complete someones family had it not been for the support of our foster network. But with the growing number of senior animals in our care–who often need more medical attention and succumb quickly to stress–we are in desperate need of more foster homes. This year’s Parade-a-Bull will be the first public event held at the site of our future facility, located at 10501 Hague Road in Fishers. 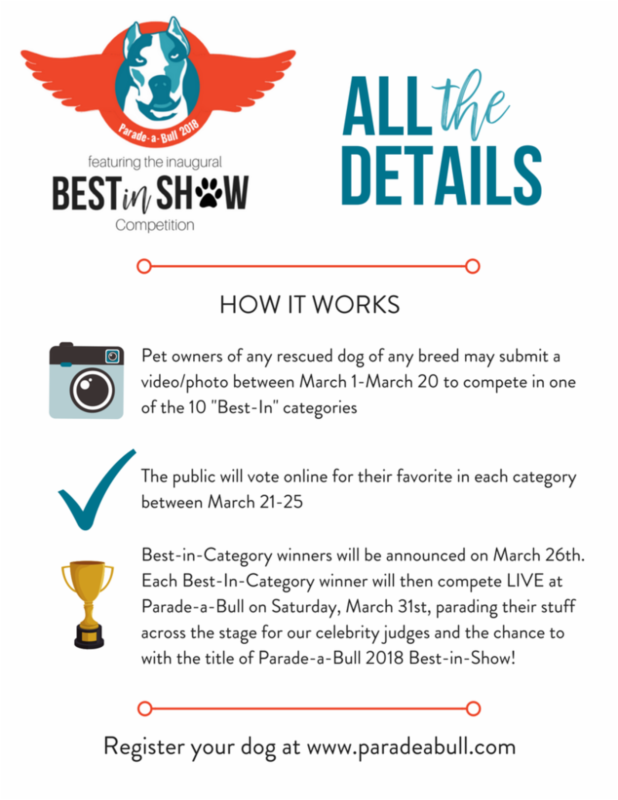 With this new location comes amazing indoor and outdoor space – so this year’s “parade” will be our Inaugural “Best-in-Show” Competition which is open to rescue dogs of any breed/mix. for the chance to win amazing prizes! Celebrate your special Valentine by donating toward the care of a shelter animal this month! Your $25 Valentine Sponsorship in honor of memory of someone special will fund approximately two days of sheltering for one of hundreds of animals in our care. The heart your give will brighten the cage or kennel of animals patiently waiting for their special someones. By request, we will also email you a photo of the ornament and your sponsored pet to share with your Valentine. Please help us fill the kennel and catteries with boundless love and countless hearts. 2017 was more than just another great year of animal adoptions and successful fundraising events. In 2017, our organization’s long-time vision of building a state-of-the-art facility that embraces our life-saving philosophy, supports our community outreach programs, and offers the animals a better quality of life as they wait for homes went from being a dream, to a reality. I believe the story of how this came together is so clearly a product of our continued faith, hope and divine planning that I’d like to share it with you. We love the holidays. It brings out the best in us. 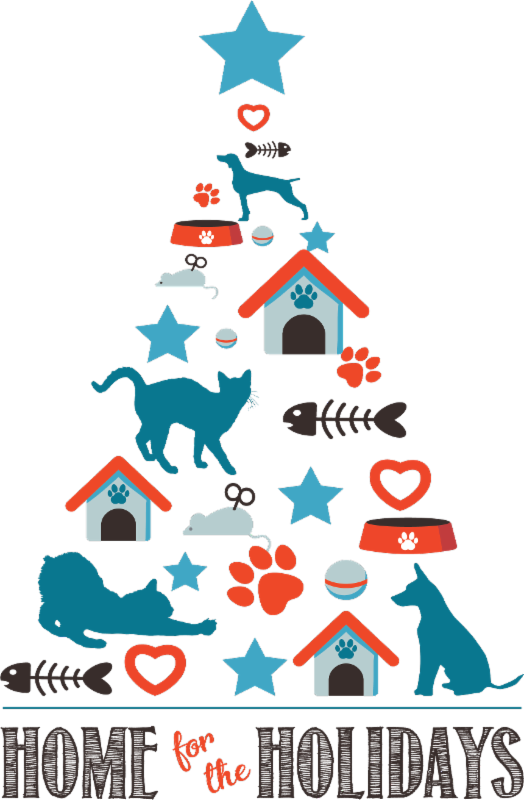 With that, we’re filled with hope that the twelve animals we’re featuring in our Home for the Holidays campaign will finally find their homes this month. Our “Featured 12” is comprised of the 6 dogs and 6 cats who have waited the longest for a home. Thanks to Paws & Play Dog Training Resort & Barkefellers Northeast, each animal comes with an incredible gift package valued between $500-$1000! Even if you can’t adopt one of these deserving animals, you have the power to help them find the only thing they’ve ever wanted…a loving home. –Pick one of the 12 and become his or her advocate by sharing their story with family, friends, co-workers and via social media. If we work together, our holiday wish and theirs will happen. Each will wake up Christmas morning inside walls of a loving home…not a cage. Once a year, your donations are matched dollar for dollar doubling the chances for the animals in our care. That time is now! Thanks to a generous group of donors and HSHC board members, donations made to our Annual Matching Campaign will be matched up to $30,000 during the month of November. The opportunity to raise a total of $60,000 for the animals in our care is one we can’t afford to miss. The number of animals in need of emergency and life-saving care is greater than ever before. The number of senior animals surrendered each day, who require more care and wait longer for homes, is on the rise. The need is great.